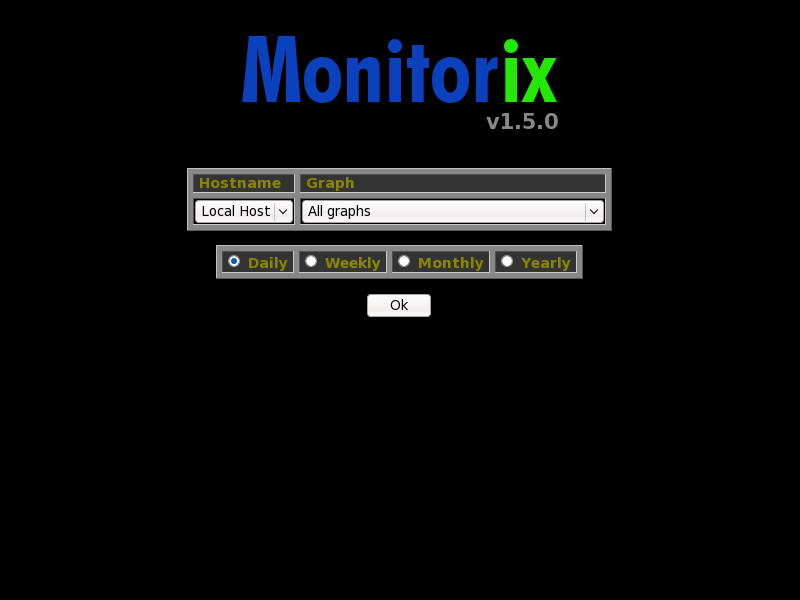 Monitorix is a free, open source, lightweight system monitoring tool designed to monitorize as many services as possible. At this time it monitors from the CPU load and temperatures to the users using the system. Network devices activity, network services demand and even the devices' interrupt activity are also monitored, and more. The current status of any corporate server with Monitorix installed can be accessed via a web browser. It has been designed to be used under production UNIX/Linux servers, but due its simplicity and small size you may also use it to monitor embedded devices. All its development was initially created for monitoring Red Hat, Fedora and CentOS Linux systems, so this project was made keeping in mind these distributions. Today it runs on different Linux distributions and even in other UNIX systems like FreeBSD. o System core (CPU load and temperatures, active processes and memory allocation). o Global or per-processor/core kernel usage (user, nice, system, idle and i/o wait). o Temperatures (HP ProLiant IML Agent and LM-Sensors with HDDtemp support). o Mounted filesystems and disk i/o. o Activity of up to 5 network devices. o Use of SMTP, SSH, FTP, Telnet, Samba, NetAtalk, VirusMail, FAX, POP3 and HTTP services. o Complete MTA statistics including anti-spam, anti-virus and greylisting. o Activity of up to 12 predefined network ports. o Devices interrupt activity (APIC support with up to 256 different interrupts). * Support for HP Insight Management Agents for ProLiant servers. * Support for Samba v2 and v3, Sendmail, Postfix, NetAtalk, Qpopper and Hylafax status logs. * Support for the Nginx web server statistics. * Support for remote servers monitorization (Multihost feature). * Silent mode to be able to retrieve the graphs from scripts or other programs. * Traffic statistics are stored on disk into RRD format fixed-size databases. * Possibility to view statistics per day, week, month or year. * Possibility to view statistics with rendered graphs or in plain text. * Each picture can be zoomed in to see the graph in more detail. * Monthly traffic activity report via email can be sent to LAN users. * It warns if some selected network port is not listening. * Alert capability if CPU load average reaches or exceeds a threshold value for an specified amount of time. * Web interface offers minimal learning, ubiquitous access. * Configuration with only one text-plain file. * Perl and Shell Script based (lightweight tool). * Requires the RRDtool package and a CGI capable web server. Go to the Monitorix directory and execute the install script. Welcome to Monitorix v1.5.0 installation process. The install script has detected that this is a Linux operating system. Choose the option number 3 (Debian). Last chance to stop the installation. The list of paths should be correct. Press y. If you only see the skeleton page without the graphs that probably means that your web server (Apache) don’t have enough permissions to write into the $BASE_WWW/monitorix/imgs directory. Check that. I don’t see the ‘index.html’ file there, and since Monitorix creates that file every time it is started, I suppose you don’t have started Monitorix yet. can i handly create ‘index.html’ file? where i can find that file and add it manualy? permissions are ok, i have some others scripts and sites on localhost and everything works fine with apache2. The ‘index.html’ file is created by Monitorix when it’s started. If your don’t see that file either Monitorix is not running or it was some error during the start. So, stop Monitorix and start it again just to know if you see any error message. It could be useful to see your current /etc/monitorix.conf file, please, send it to the Monitorix contact email. just without spaces before “>” and “< /"
and for remove monitorix ? whats the procedure ?